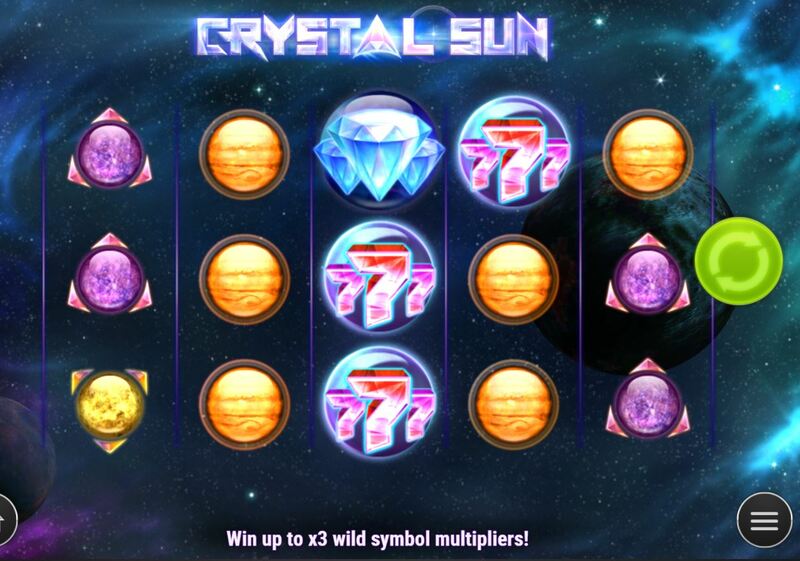 Crystal Sun slot by Play'n Go review of the new Starblast game! 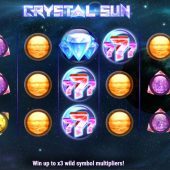 Crystal Sun slot by Play'n Go I will tell you now is yet another variant of Netent's ubiquitous Starburst game. Great if you like it, not if you don't although there's a small difference here. You have transparent reels over a background image of the cosmos and futuristic sounds as we spin and stop the reels with a few planets thrown in for good measure. It's possibly a bit better than their other low tech slots such as Inferno Star or Starblast - oh, hang on, it is actually Starblast! Will the sun shine on our bankroll here though? You have 10 fixed pay lines on Crystal Sun slot which pay both ways, from right-to-left too. Symbols are stacked and there's no scatters or triggered bonus. The 5-of-a-kind pays are 16x Diamond, 8x 7's, Green Planet 4x, Jupiter or Red Planet 3x and finally Yellow or Purple Moon 2x for a full line. You really need the Sun though to shed any light on this game. On the centre 3 reels a Sun may appear. This is an expanding Wild and will offer a 1, 2 or3x multiplier Any wins will be added when it appears and it will remain in place for a respin. Should another Sun appear, any wins are added again and another respin occurs. If you get the third and final Sun then you have one last spin with all centre reels Wild. This means you can have a multiplier of anything from 1 to 9x on wins attained during the respins and Play'n Go proudly proclaim you can win up to 4000x bet.